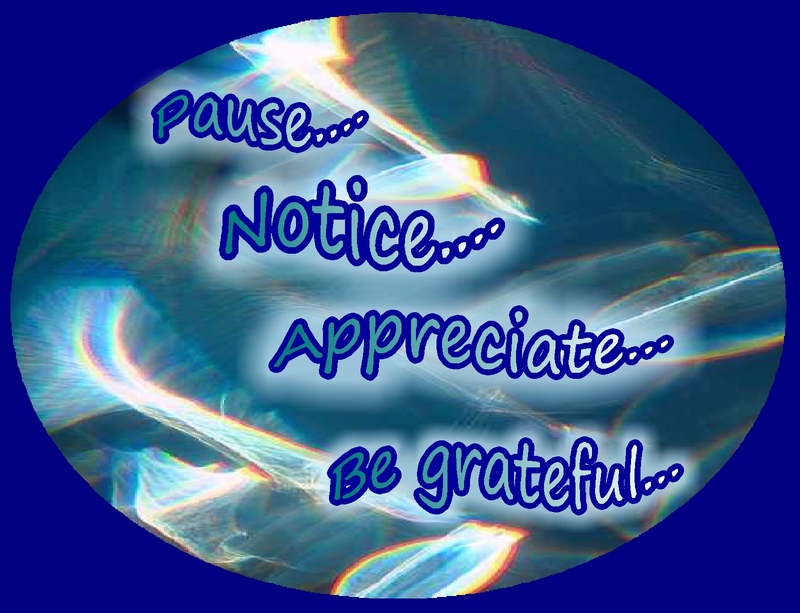 I’ve posted the “Pause, Notice, Appreciate, Be Grateful” images and ideas, some of my favorites, a number of times…including July, 2011 and again in July, 2012. I think it’s so important to keep this awareness and appreciation in the forefront of our minds. I help myself remember to do this by keeping these images in full view….right there in front of me…. printed on paper and hung on walls; printed as bookmarks, holding places in books; and printed on clear film, hanging brightly in windows…ongoing re-minders and inspirations. to live our lives with this underlying motivation…. 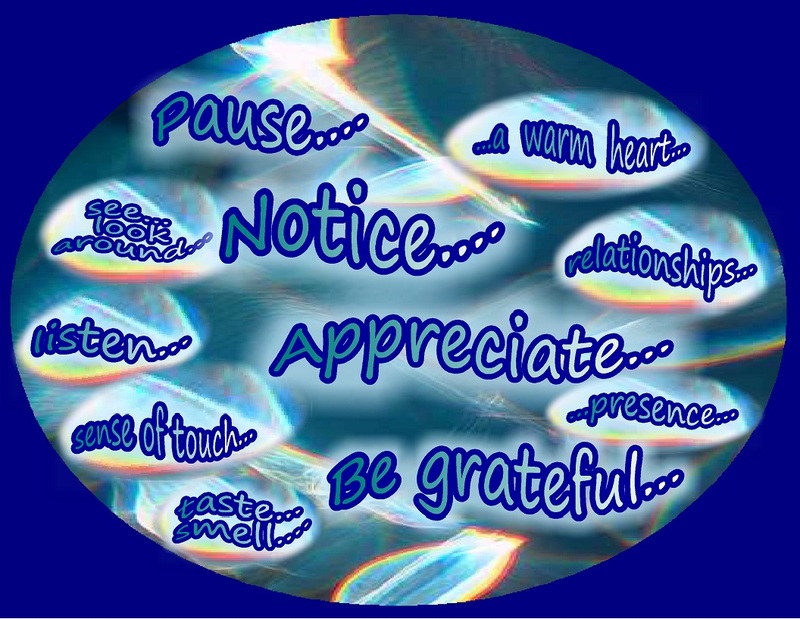 to pause, to notice, to appreciate and to be grateful. 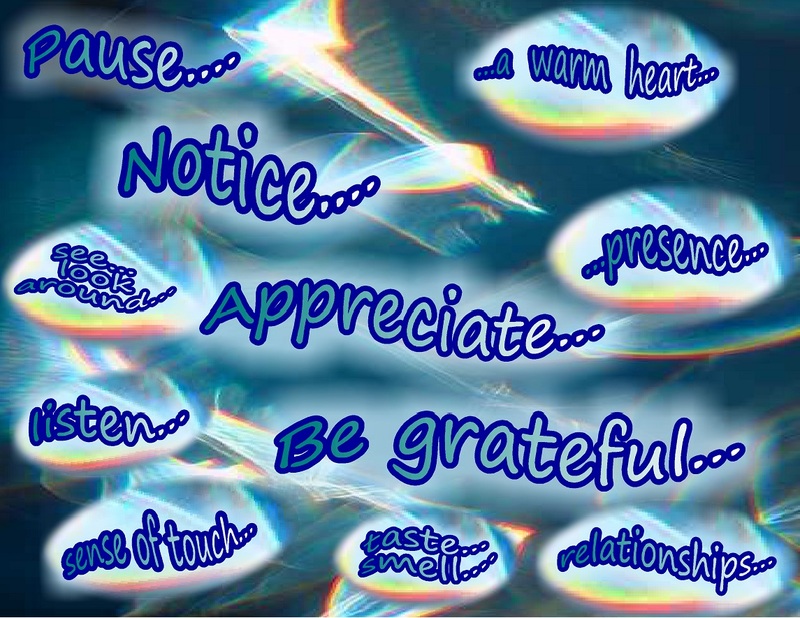 Expanding on some ideas that were in the “Notice…Appreciate” post…to help remind ourselves to follow simple steps that might lead to a more ongoing sense of appreciation and gratefulness…and so for us to take moments, many times a day… to become aware of each of our senses, our thoughts, our minds, our hearts, our relationships…. 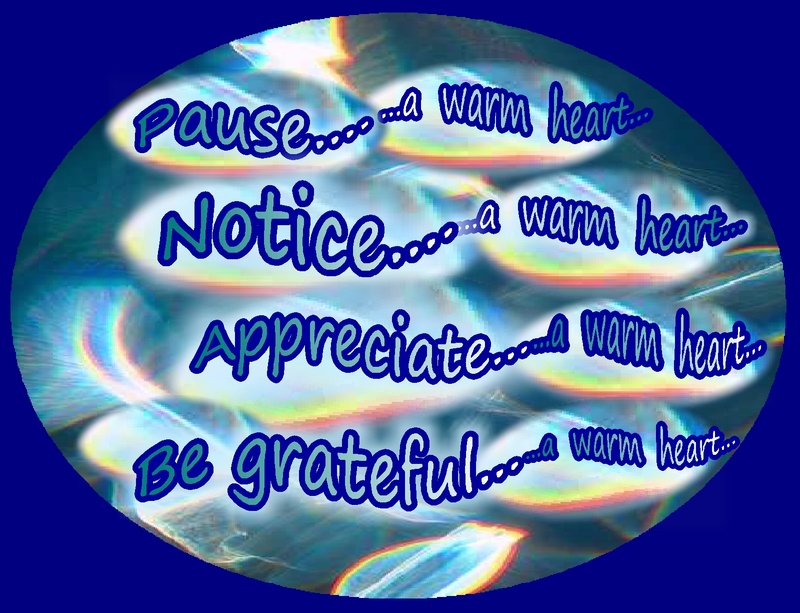 Of all those awarnesses, a warm heart… perhaps the most precious. 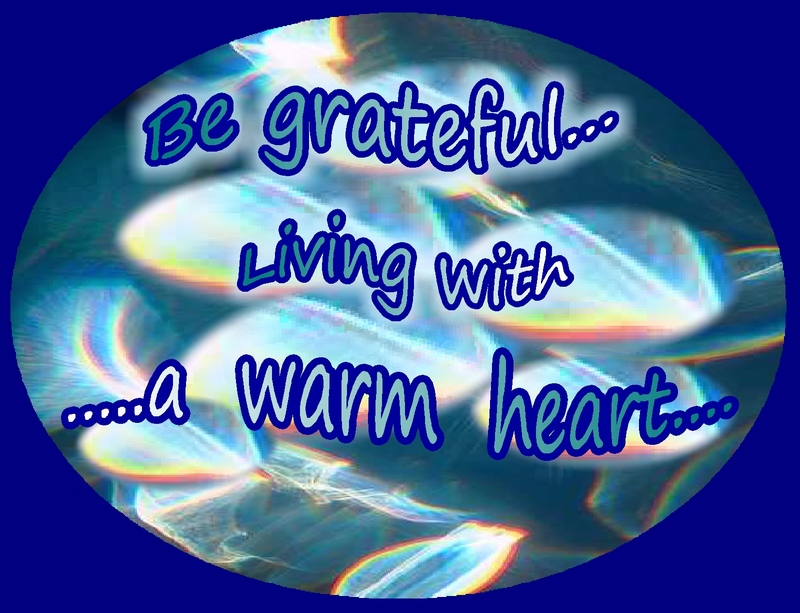 Living with, encouraging and nurturing one’s own warm heart, noticing and appreciating others’ warm hearts, contributing to developing warmth in every person’s heart… the beauty of a warm heart. True to my North Star..but also in this moment, I am loved enough, fed enough…. This entry was posted in Appreciation, Encouragement, Life and tagged Appreciation, Awareness, Encouragement, Gratitude, Happiness, Inspiration, Life, Mindfulness, Spirituality, Wisdom. Bookmark the permalink. Wow, what a great idea, Pocket Perspectives! Some of that will surely into our hearts after this fabulous and creative contribution. Many thanks for joining the Occupy Blogosphere today! I use the pages and reminder steps progression from this post all the time…amazing how I continue to need reminders! Driving along today, I remembered and paused to notice the beautiful green hills, blue sky all around…the hills have just turned beautiful green here in Northern CA… lush and wonderful! And I noticed that there are so many kind and helpful people out today, too. 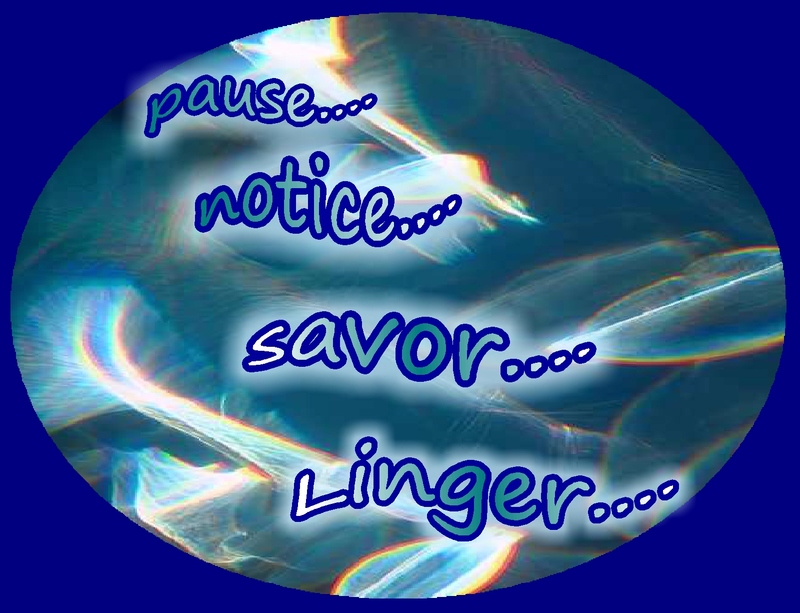 pause, notice, appreciate, be grateful – you’ve captured the heart of what I call Walking in Beauty. you do, my friend, you do! My heart expanded as I got pulled into your words and images. Your posts often has this affect on me and it’s wonderful! I love the comment about you Walking in Beauty, because you do through all you share with the rest of us. thank you, Marie…and Joss…those may be some of the kindest words ever mentioned to me….and I thank you from a tender and gentle spot in my heart. Four simple words with huge results when practiced on a daily basis. A good reminder for all of us. Love the idea of placing them in many areas of our daily lives to remind us.